Club Penguin Cheats by Mimo777 Club Penguin Cheats by Mimo777: Club Penguin Flags Now Available For All! Hey, non members can now buy flag pins in the Penguin Style Catalog! Club Penguin also added a Haiti flag! WOW THT IS SOO COOL!!!! I have an america costa-rica france mexico and soon ill have a haiti flag!!! Thx 4 letting me kno! Wow! CP got a Hati flag!? I only have one, (Germany of course) But in about to have two! and flags for non members? great! Cool! P.S. Mimo there is a new title screen. i hope theres "indonesia" flag pin..
Non-members always could buy them. Haiti is new but non-members could always buy flag-Pins. oK, cool, but there are too much few flags! my country's pin is still not there! It really is cool! That they have a Haiti flag, probably because all that happened there right now they're probably helping them in Haiti, that's why they put the flag up. Mimo! On one of the home screen pages when you log in, it has a page that says, 'Members, look for new puffle furniture this month' and it has a picture of that square puffle. I can't wait to see! As you know, Mimo is a very busy penguin. His friends list might be full and thats why he doesnt add people that much. He hasnt even added me yet. We just have to be patient and wait. Thanks for the Question! I have a America flag and a Canadia flag. the Canada Flag cause that's wear I live and the America Flag cause my mom is America. whoever BP is, you are wrong as when i was not a member i couldn't buy them. Anyway its good non members can get them now. Mimo check out the NEW nightclub!!! theres a disco ball and walls with these dots that move across. Much better. I think thats totally awesome, Mimo. Hey, I know you said i have to be a mod to meet you, but could you add me as a friend sometime? That was there last month! Kewl a Haiti! I have every single flag on there! Woohoo! I've been waiting to get the Ireland pin forever!! YAY!! CLUB PENGUIN ROCKS! Cool, I bought the haiti one. hav a cheat here - if u go into box dimension and throw a snowball it bounces! its a small cheat but it looks good! thanks to snowy825 for showing me this! Cool! I'm a non-member and we never got to buy Flags!! Also, my school raised £2,402.32 for Haiti because we had a non-uniform day. Some kid's nanny in my school raised £2,000 by having a sale. Another kid donated £50 to Haiti instead of having a birthday party! Anyway, donate as much as you can! Yea, but the new nightclub upgrade is call "Discotheque" But your right it is awsome! Yep, thats because of the Puffle Party that is coming! Are you going to go? If so, see you there! Though I still don't have a flag for my country, because I am from Lithuania. U might not now where philiphenes is it's in asia and come from there! U GOT A PROBLEM WITH DAT! I'M PROUD OF MY COUNTRY! like i said u got a problem with that? P.S i didn't really wanted to shout it's just dat everybody keeps asking where i'm from... it just get's in my nervs! Hey Mimo doesnt add people at partys unless there close friends or mods or a higher mod rank. So no. But try being a mod. Then you may be able to meet him! Sorry but Mimo does only normally add Mimo mods or a higher rank mod. Try being a mod then! Mimo doesnt really meet people online unless they are Mimo mods or a higher rank mod. Try being a mod! Meh, I saw them yesterday ad just assumed they had already been like that. You know what they should have Mimo?They should have a coins for hatti on Club Penguin.Do you agree? Last year on Febuary 5th Australians were very grim. This was becuase of Black Staurday. There were bush fires all over the state. Worst natural disaster in Australia EVER! It claimed homes, widlelife like Kangaroos and Koala Bears and most of all... PEOPLE! Im lucky I wast in the bush fire zone! Show your support buy wearing the Australia Flag Pin on Club Penguin today! Also show your support for Haiti. Non Members can also buy flags now! You are very right! The Club Penguin team is planning big things with these puffle catalog... be sure to check it out! CP is supporting the Haitian people! This is very nice! I got the great puffle switch at home! I got it today! I agree! That would be great!! 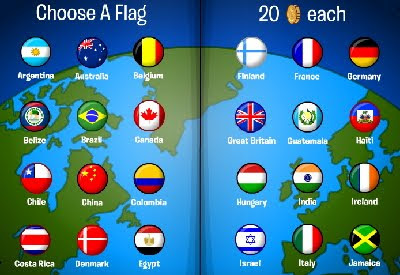 I got all of the flags, just for fun! I think every penguin should where Haiti pins in memory of Haiti. Yeah! that's a great idea! That's not neccessarily true because i used to be a non member really long ago and you had to be a member to buy flag pins. Wow. Cp/disney actually is expanding. No more member only thing! maybe cp added that flag because now nearly everyone knows about Haiti and if there are penguins from Haiti people will have to be extra nice because of everything that has happenned there. Also i have to say this. Haiti get well soon! i'm sure everyone here is thinking that. Well i don't think it will be likely to be mimo's friend that easily but i have advise! Become a mimo mod or make a very good Haiku! Mimo has already mentioned the new night club changes. And i agree that BP's comment wasn't correct. Wow you are setting a great example for all of us! And i have to say, great work! I totally aggree! Haiti needs money badly and I am very surprised that Club Penguin hasn't done something like that already!! Dear Mr Bonington, Mimo has already posted about these cool nightclub additions. Did you see his post? If not, you should check it out. It told us tons of stuff with the addition! even though i live in america, go phillipines! I'm part hawaiian too, everytime i go to hawaii people say i look like a local and always asks me directions. i think they should do what they do for coins for change. the coins used to buy the flag could be donated to people of Haiti. Well, you need to remember that they are bringing the caves back later this month, and the underwater room is for members only. They probably don't want non members to feel even more left out, so they did this. Where is the Greek flag??? Greece rocks!! LOL it says "would you like to BUY HAITI!!!! lol it says it like ur buying the island lol! K, not that many ppl voted in my weekly poll, so...yeah! I will have another one out on Monday! I got USA (of course), Ireland, and Haiti. Ireland because I'm a teeny bit Irish and Haiti because of that's been happening now. I wish the would add the Czech Republic and Slovakia because I'm Czech. Oh, and I got UK because I'm English too. Good idea! :) I'm totally in! Sorry, Mimo can only meet you on CP if you are a Mimo Mod or above! (Aww I'm only a Super Mod!) But you should become a Mod, it's really fun! Um really? No, only the background was there last month, then they started to add more pins, now it's available to everyone! Yay! But no that hasn't been there! I know, it is pretty sweet! Umm...ummmmm...No, sorry, they couldn't! I remember watching my non-member friend try to buy a flag the other day...She couldn't! Where? I didn't see it. The Night Club didn't go back to normal, it is there forever, you just have to have a lot of people in order to make it work. yesss! woot! the no caps rule prevents me from expressing my joy completely! Im sooo happy. 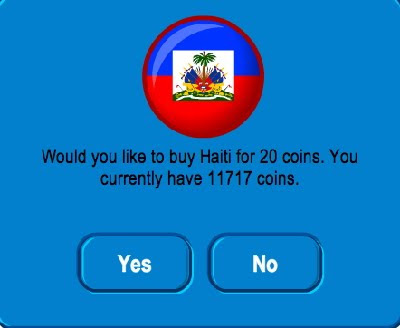 "Would you like to buy Haiti for 20 coins?" Wow! I never knew Mimo wanted to buy Haiti! What're you going to do with Haiti, Mimo? Just joking. Anyway, I think it's awesome that Club Penguin added flags for non-members, too! Looks like Disney is putting things for non-members! Non members rock! They should have a Greece flag! Contact them and see. He will probably post them somewhere around next week! Sadly, no. But he will add you if you go to a Planet Cazmo party! Nope, only members have been able to buy them. Club Penguin even said on their blog! Sorry! Mimo can only add you at Planet Cazmo or if you are a Mimo Mod. He can't meet anyone either because it won't be fair to others! Of course, Slidoo! Just answer pplz questions and in the next Mod overhaul, he may "premote"you to be on the "Wall of Mods"! That reminds me, Mimo: Mod overhaul in a week or two...? Maybe? No? I should stop bugging you? Ok? Ok! Honestly, it is the most talked about place because people are trying to help these victims... which IS NOT FUNNY at all!!!!! If you want to be a mod... read the mod rules, and WORK HARD!! IDEA! CLUB PENGUIN POSTED THE HAITI FLAG FOR A SECRET FUNDRAISER!! LIKE COINS FOR CHANGE, BUT FOR EVERY PENGUIN WHO GETS A HAITI FLAG, THE COINS WILL TURN INTO CHANGE FOR HAITI! EVERYONE, BUT A FLAG1!! Yeah... I am like 80% Greek, and I have written into CP MANY times asking them for a Greek flag.... try writing in!! -------------------------------------------------------------------------Mimo always adds at his parties! That's an awesome thing, but unfortunatly he cannot add everyone. But the good thing is that he likes to send people postcards too. cool!!!! i finally can buy my country flag! i buy singapore cuz im a singaporean and i buy japan n korea too! as i like those 2 countries! both of them r cool!!! i also hope thr is indonesia flag as my relatives r from thr! I have to disagree. I've been playing clubpenguin for quite a while and as long as i have been on cp, non-members have never been able to buy the flag-pins. I've tried many times and gotten that "become a member" message.Non-members being able to buy the flag-pins is a new thing. It must be annoying if people keep asking you where you are from. But regarding your P.S. comment, it think it was unneccesary. If you didn't want to shout, then you shouldn't have shouted. It is good you are proud of your country, but try to be courteous to other people. Thanks. You know what they should have Mimo? They should have a coins for haiti on Club Penguin. haha! i totally agree! it sounds like you're going to buy the country or something! Mimo would be a good ruler too! :D hehe. K E E P R O C K I N G ! ! ! Is Club Penguin going global??? (to Japan???) Because... WHITE HAIR?!?! SERIOUSLY?!?! WHITE?! But other than that, it's all good! Sorry not to discourage you but Mimo probably wont add any of his fans. The only people he really adds I think are his family, and people that he throughs partys for. On occasion he might have a party where he will MAYBE add one or two people but dont get your hopes crushed maybe someday he will have an all out mimo friend party! That would be cool! Ya sorry to burst your bubble but this is the first time EVER in CP where non members can buy flags. Probably because people started complaining about how there are not enough non member items. Ya sorry but Mimo rarely adds anybody unless he knows them personally. Family and stuff like that. Club penguin haven't a Romania flag. Excuse me Mimo but this is really freaky. My friend has this background which has spotlights(and a white line goin through da middle)! They move around and one of them says only for £29.99. Is this a glitch? Hack? Cheat? Wow brilliant! Its so cool. I Can,t Wait for Puffle Party! Also I have a Question, How to you reply to a comment, can only Mods do it? awesome but why isnt Austria on there? i am Australian with a dutch backround and Austrian back round. It says would you like to buy haiti! Thats means we can buy the country! It doesnt say Would you like to buy the haiti flag! LOL! umm... i know this doesnt concern anything about club penguin but do u have any wiglington and wenks cheats? Lol, the change don't really effect me cause im member and i have always had UK flag on but im happy for all you Nons! You should try emailing CP and ask them to add a few more flags! Good luck! Thats a great sneak peak! No they haven't.Sorry to dissapoint you but before my non-member penguin could not buy them and my non-member friends could not buy them. Sorry, Mimo only adds really close friends and mimo mods! Day out with Racet2000!! I will add you and play with you for 1 WHOLE one hour!! You have to get the closest number to get this question right. This contest ends tomorrow! Here is the question: How many days old is Racet2000, It is a Palindrome, It is even, and its more than 600 and less then 1,000!! Be the firest one to get this right, and you will out with me on CP for one whole hour, add you, AND have a party for you. Date will be decided when person is chosen!! Hey Mimo. Blogger lets you have pages now!! You should put up a few new pages like one with all the cool cheats and glitches! Great idea! I'm also doing that!! YAH! Modding is LEGENDARY fun! Soon it will be Mimo fun. Then Mega Mimp fun. Then TOP FUN! Lol!!! Hahaha. I'm going to wiN! Mine was pur-ty funny!! Slidoo, here's some advice for becoming a CPG Mod. Answer questions other people have, and if you answer enough, you'll become a Mod. Good luck! Yeah! I noticed that too!! I really like the machine-type thing that the green puffle is using... Good Eyes!! I never noticed how many different countries people on this site live in! It's AWESOME! Rock on, everyone. -Toysgoneby (CPG MOD) GO CPG12!! i found MORE NEW FLAGS!!!!!!!!!! you forgot: Costa Rica, Guatemala, Malysia, Peru, Phippines, Puerto Rico, Sinapore and Venezuela . can i have credit??? guess what? 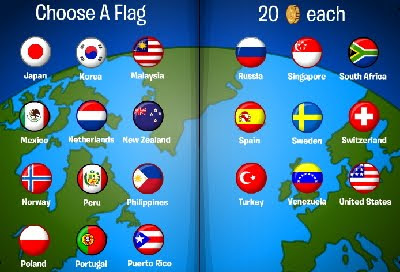 Phillippines has a flag in cp now! go and buy it! Mimo can only add you if you are a Mimo Mod or higher, sorry!! Wow! That's sweet that they used your idea! Great work! Hey mimo I don't mean to be rude but the puffle switch has come out in different places (maybe canada) and doesn't come out here until that date. I have saved up a lot of money and will probably buy it off amazon. Yah! Lets buy a Haiti flag to support Haiti!! Go Haiti! sweet! maybe they will make more non member stuff! i hope so! Wow it sounds like you plan to buy them all. Good luck earning enough money and I hope that pickle tastes good. Mimo, my best friend, Swimpeng2007 is trying to become a mod! He is doing great! I am proud of him! That's great Memaggie. I hope you get enough money to get the Haiti pin soon. Yes i am. Racet2000 told me to. I know, right? I told him too! Lol!! Yah, Mimo Mod or higher! Non- rights are great for non-members. But, they don't do anything for members! Lol! hey when r we going to find out who won the poem contest? No actually flags were members only. There used to be a glitch that let non members wear them, but it was fixed. Yes! I'm a non... and I bought all of them! I'm from the Phils (philippines) so I wear that alot. My mum thought it was weird that I bought all of the flags... especially since I bought some that I don't even know which country it belongs to! When are we having our super bowl partY? I dont' think he will if you mean cp party. He only adds mimo mods, mega mimo mods, and top mods. I also think that is the reason Clubpenguin put up the haiti flag too. I am sorry that your countrys pin is not there. Maybe you should send a message to Clubpenguin asking about if they would put the pin up. Hey Mimo I gave Club penguin the Haiti flag idea. I emailed them im suprised they used it. That was a great idea you had. If I were you i would be surprised to. The nightclub is a lot better since they added the improvements. Wow! I saw that too! Good eye!